Preheat oven to 200°C/390°F. Deseed pomegranate and set aside. Chop parsley and mint, and set aside as well. Wash potatoes and cut into wedges. Peel and quarter carrots and shallots. In a large ovenproof pan, fry bacon bits over medium-high heat for approx. 4 – 5 min. or until crispy. Remove from pan and set aside. Heat oil in the same pan over medium heat. Salt chicken breast and sear on both sides for approx. 1 – 2 min. or until slightly browned. Remove from pan and set aside. Add butter to pan and fry potato wedges for approx. 2 – 3 min. Add carrots and fry for approx. 2 – 3 min. more, then add shallots and continue to fry for approx. 1 – 2 min. Season with salt and pepper to taste. For the marinade, add mustard, honey, garlic powder, curry powder, chili powder, sea salt, and pepper to a large bowl and stir to combine. Add chicken breast to bowl and toss to coat. Place marinated chicken breast next to vegetables in the pan. Add chicken stock, then transfer to oven and bake at 200°C/390°F for approx. 15 min. 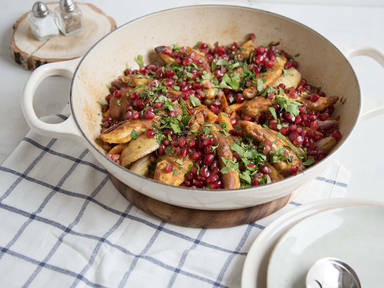 Serve with fried bacon bits, mint, parsley, lemon zest, and pomegranate seeds. Enjoy!